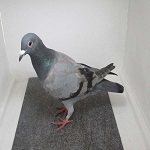 Racing Pigeons,Show & Fancy Pigeons :: Message Forum :: R.P.R.A. 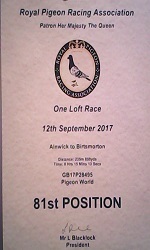 Oneloft Syndicate 2017.
as most of our members know, we were too late to re enter the rpra one loft in 2017, so had to go with the mnfc.......and although darrens two birds did us proud, both making it to the final, I`m sure most will agree the rpra one loft is better. so if we want to enter the 2019 rpra one loft, I reckon we best start earlier this time, to make sure we get in, these are the names so far who want to join the syndicate, anyone else wanting in, post your name up on this topic.......I would think the cost will be around the same as the last couple of years, around £20 per member, unless we decide differently. plus we will have half the money, what our mnfc bird makes at auction to add to funds. Missed one David he is about 4 foot tall shifty as sh*te Patch on one eye carries a sword to school etc & is teachers favourite I hear along with being the No 1 man with all the chicks in his class . yes Darren, I for one would like it if you would send two ybs to the rpra one loft, they did us proud in the mnfc..........hope we can get enough members joining to maybe send four birds again. Thought I had mentioned being in. Anyway put me down as participant. Would be pleased to have a go, just give the address for the entrance fees. thanks for being part of it hal and misty, glad to have you both involved.....I`ll dd you both to the list. I would think that last year the syndicate birds did better than any other entries with just four. £20 for a number of weeks pleasure appears to me to be very reasonable. To some extent the races are a lottery and the more entries the better the chances of one or more getting away with all the possible problems they may encounter. 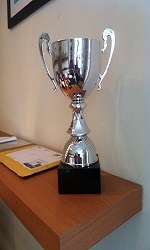 For around £40 the syndicate could double the entries and have a better chance of having more innthe final race. I know that some fanciers may not want to pay that amount for too many birds but the more the merrier. I think we had around 20 members for this mnfc misty, and that worked out ok for entering four birds, plus we had to pay carriage to the one loft, and we also had £50 winings from the 2017 rpra one loft, and also 50% of what our pigeon made in the auction, which was another £35 (bird made £70) in the kitty. this time we will have 50% of what the mnfc bird makes in the auction, to carry forward to the rpra monies. If I or anyone else had to buy some first class youngsters with a reasonable chance of doing any good they would have to at least pay £100 each, I know I could get as many pigeons for nothing but not everyone can. So to pay £20 odd pounds each to enter them in a syndicate offers very good value for money because every member will get the same enjoyment and although the pigeons did very well last year if oldstrain had bred twice as many who knows? I know it is a selfish outlook because it will be the only means of beingi involved in the sport now but the more chances of having them in the final the better. The sooner the monies are in the better chance of getting in, the reason I am keen on paying, at my age you can kick the bucket at anytime and I dread dying owing anyone anything. good to have you involved briant, well done.........I`ll add you to the list. 14 members already, plenty of interest so far.........if we all pay £20 each that's £280 so far, plus 50% of what our mnfc bird makes at auction, I think we had 20 members for the 2017 mnfc one loft, so would be nice to equal that. Subject: Re: RPRA Forum Syndicate 2019.